Vale is positioning itself for a rebounding iron ore market, but if there's no rebound the miner's shares could continue to struggle. 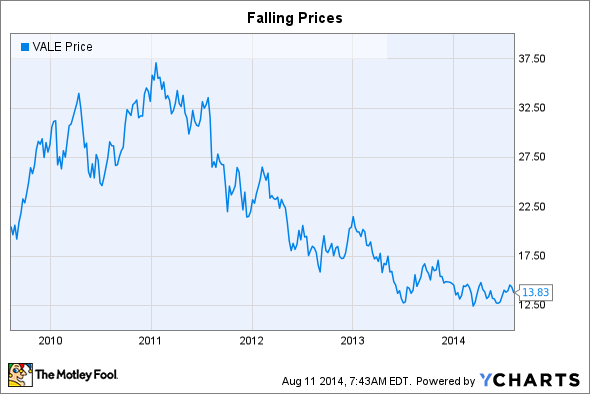 Vale's (NYSE:VALE) stock has been headed lower for several years. While it looks like the downturn may be nearing an end, that's no reason to ignore potential pitfalls. And right now there are a few big ones to consider, including economic growth in China, projects outside of iron ore, and the still notable impact of logistics. The big story in the mining industry for the last decade or two has been China. This giant nation has roughly 1.4 billion people in it. That's nearly 20% of the Earth's population. For comparison, the United States has a little over 300 million people, or around 4.5% of the world's population. No wonder roughly 35% of Vale's sales were to China in the second quarter. However, that's a huge exposure to just one country, no matter how large it happens to be. And while China's economic development is far from over, it's entering a new, slower phase. For example, international steel giant ArcelorMittal (NYSE:MT) noted that steel demand in China advanced 6.9% in 2013. However, it's projecting that demand could fall to as low as 3.5% in 2014. And while ArcelorMittal expects global steel demand to be flat to slightly higher in 2014, the slowdown in China will have a notable impact on companies like Vale that sell iron ore to the country. So even though Vale may be right in its preparations for higher long-term iron ore demand, if China continues to slow down in the near term, Vale's stock would likely react poorly. Iron ore accounted for roughly 70% of Vale's top line in the second quarter. The other 30% is spread over investments in nickel, copper, coal, and fertilizers, among others. On one hand, it's a good call to diversify. On the other, Vale has pretty much admitted it isn't as well positioned outside of iron ore.
For example, one of the company's key goals is to slim down via asset sales and partnerships. Coal and fertilizers are two areas that have been in play of late. And while the official line is that Vale is looking to streamline its business and cut costs, it's fair to be concerned that its investments outside of iron ore aren't doing as well as hoped. And, worse, could become a distraction to its main line of business. Watch these other assets, as they could restrain the benefit of an iron ore upturn or even cause Vale's shares to slump. That's a bigger risk if iron ore prices continue to flounder. Vale is a low-cost miner, but it's located far away from its biggest customer, China. It takes Vale 45 days to move a ship from South America to China, versus the 15 day trip competitors have from Australia. That's a notable issue to contend with since shipping ore is expensive. Vale is doing the right things to mitigate this issue, building gigantic ore ships to reduce costs. Vale's Valemax ships, for example, can handle two and half times the ore as similar haulers. That reduces shipping costs by increasing productivity. However, if iron ore prices remain in the doldrums, or fall further, the shipping cost hurdle will continue to be a big detriment. Valemax ships will make the logistics issue better, but they won't make it go away. And the real benefit of Valemax ships won't be felt until iron ore prices go up. Once again, Vale is positioning for the very long term, but that doesn't mean its moves will help over the near term. Vale is making the right moves for the long-term trends it's seeing. However, those efforts are occurring now, during a mining downturn, leaving the future highly uncertain. If iron ore prices don't start moving higher, investors will likely continue to punish Vale's shares. If you can stomach near-term volatility that may be OK, but it could mean sitting on capital losses while the mining industry rights itself... whenever that might be.